A wise doctor once wrote that life is “a great balancing act.” This was before his appointment with a lanky cat in a hat. Although a discerning piece of advice, Dr Seuss most likely did not mean for this to be taken literally. Yet for many individuals in China life is indeed one gargantuas balancing act, the toppling of which could result in a fatal burial under mountains of heavy consumer goods. 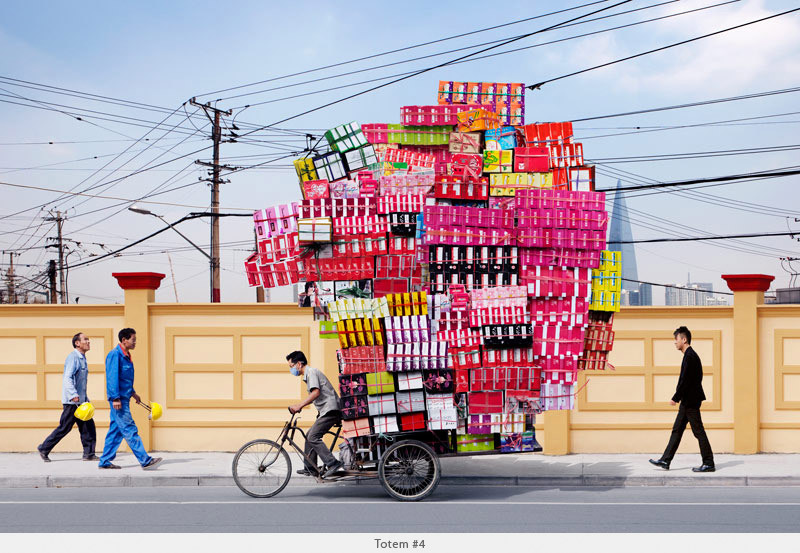 Following on from Ni Haifeng’s critique of the consumer society, French photographer Alain Delorme similarly highlights this phenomenon in the East. 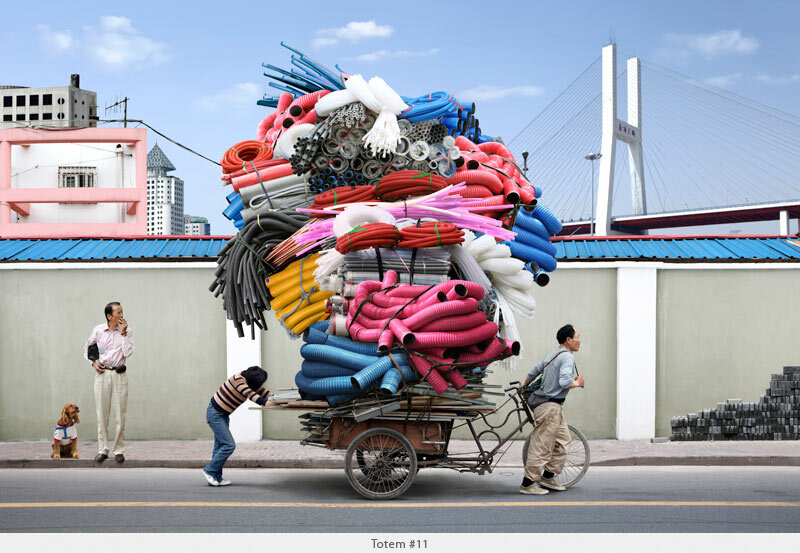 Yet unlike Haifeng, who positioned China as the sidelined producers of global capitalism, Delorme’s photographic series captures a participating nation at the heart of the system, as migrant workers struggle to transport mountainous piles of goods across Shanghai. 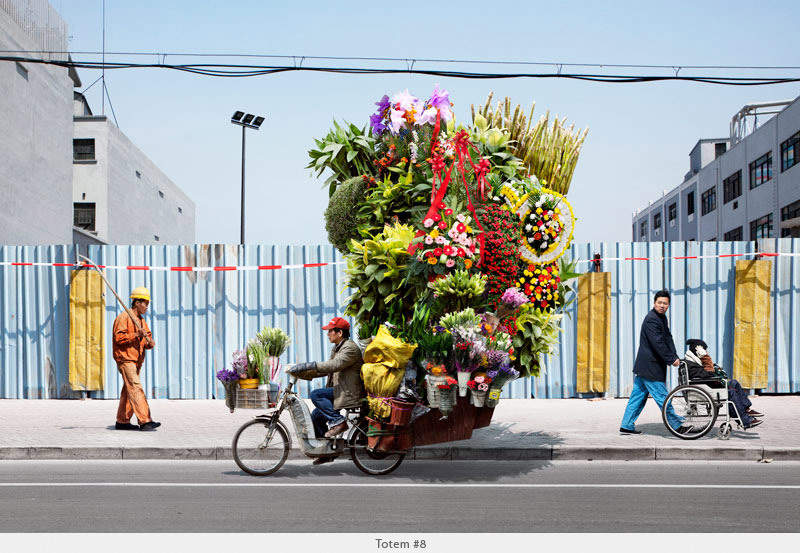 One thing however, that Delorme’s work shares with Haifeng’s is the stress he places upon the individual labourer at the centre of this thriving consumer culture. Chinese society is often viewed from the outside as emphasising the collective over the individual. Delmore’s photographs are entitled “Totem No. 5,” “Totem No. 16” etc, which certainly plays upon this idea of workers as an anonymous labour force rather than unique individuals. 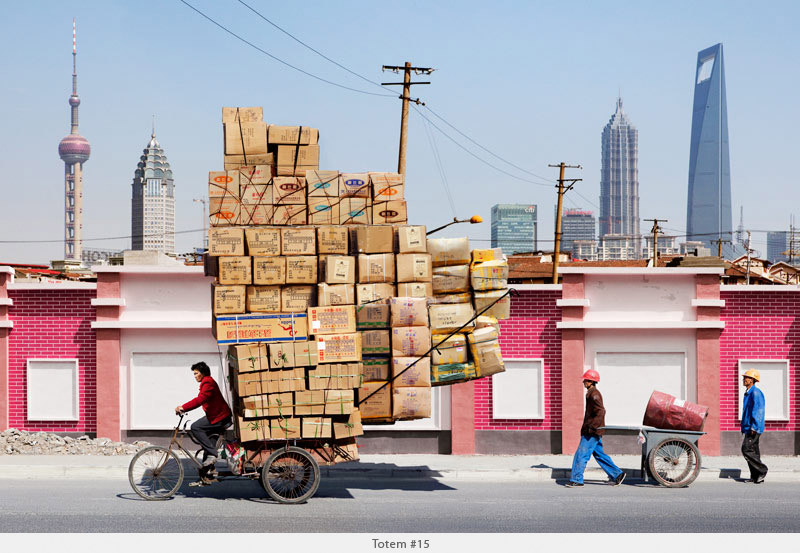 Yet the foregrounding of these individuals, together with the exaggerated amount of goods being transported, equips the workers with power and strength. They are not merely the insignificant shadows of a behemoth system but rather the all-mighty driving forces upon whose back the entire system rides. The skyscrapers and giant infrastructure are diminished in the background to a meagre 2d presence. It is not the city’s towering structures but rather the little people below who laboured to bring them into existence to which we should look at in admiration and awe. Also, in each photo there are other individuals who seem to be participating in the process. In one, two men walk by carrying yellow construction hats while in another a man passes through, lugging a small ladder on his shoulder. Although these items may be smaller in volume they certainly are not in their significance. These individuals are all striving towards the same thing, united in their work yet without the weight of their individual contribution being diminished. The bright, bubblegum colours and almost collage feel all adds a touch of humour to the more sober message being portrayed, which Delorme added to “give the feeling that somehow something was bizarre in the image.” With inconceivable pyramids balancing upon the back of a bike, we may feel we don’t need any additional flourishes to evoke a sense of strangeness. But by adding these incongruous colours to the buildings, the walls and billboards in the background, it is these ordinary, commonplace objects the artists wants us to question. It is the very system that we are all working towards creating and maintaining that needs to be reevaluated. Previous articleContemporary ArtNi Haifeng's "Para-Production"